Vitamin E-infused formula helps prevent lipstick from fading, feathering, and bleeding. Swivel-up, fine-point pen needs no sharpening. 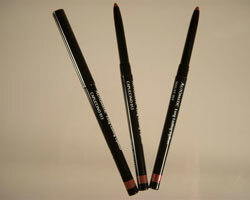 Left ~ Cappuccino ~ A wonderful everyday neutral that will work quietly with all shades of lipcolor. Right ~ Mauve ~ A great combo of pink with a hint of brown that will works with all cool colors of lipcolor.